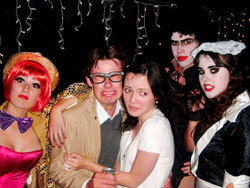 - The first time I was exposed to the phenomenon that is Rocky Horror was in the year 2001. My dance school was to perform the Time Warp, and someone was needed to be the "The maid", so I eagerly took the role in an attempt to get my moment in the spotlight. I instantly became addicted to the song and went right out to by the 25th Anniversary DVD. Needless to say, I fell in love. From first appearances, I was a seemingly sweet and innocent 9 year old girl... but I was seriously corrupted by the world of Rocky Horror. Safe to say, my "highly moralled" teachers didn't take to kindly to me teaching the year 4 class "Sweet Transvestite". - When I hit my 'awkward' teen years, the film took on greater meaning. When you were in the crowd of fans, you were one of the family; an equal to everyone else. I loved being able to be myself without worrying what others thought. I love dressing up (Although in many cases it was really dressing down). I love the people. I love the atmosphere. Rocky Horror and Shock Treatment have inspired me, changed my life in so many ways. Unfortunately though, New Zealand hasn't had regular screenings of the Rocky Horror Picture Show since 1988 so I mostly rely on my DVD's. - Favourite characters? Riff-Raff and Magenta are an equal first; individually they are both remarkable but together they're even better. Riff-Raff had me at "hello". Magenta is gorgeous, has an amazing voice and Facebook (the all-knowing) says I'm most like her "trying to pull off the innocent act even though everyone knows I'm not". Either way, Richard and Patricia are pure awesomeness. - I run/manage/founded the Patricia Quinn, Bert Schnick, Cosmo and Nation McKinley fan pages as well as the Shocky Horror website which, to the best of my knowledge, is New Zealand's only online RHPS or Shock Treatment related fan page. Shocky Horror's current mission is to bring back midnight screenings in Auckland, as the last one was over a year ago. - I play Nation/Magenta in the Shocky Horror Experiment - Re-filming popular RHPS and ST songs/videos with modern day twists. I also make the costumes. - Outside of Rocky Horror/Shock Treatment, I have no life. Kidding... sort of. In my "normal" life, I'm a student and budding filmmaker. I constantly annoy my friends by picking out continuity errors or over-obsessing about RHPS or the X-Files. In the future I hope to attend a Rocky Horror convention in the US but also to throw one here in NZ.